The World of Coca-Cola is aptly named. 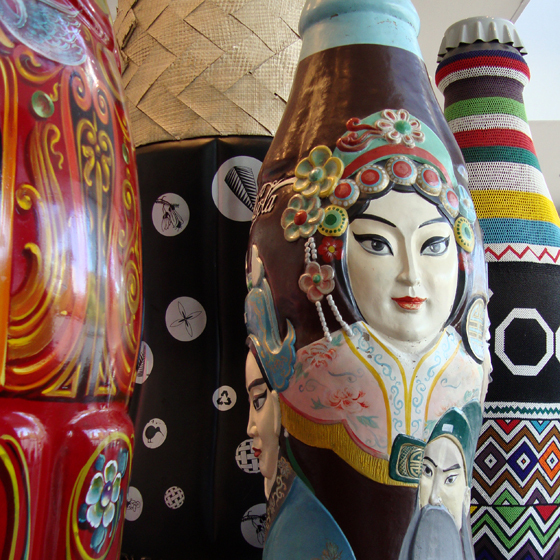 As the world's most popular soft drink, the museum shares the how, when and where Coke arrived on the global scene and its place in today's society. 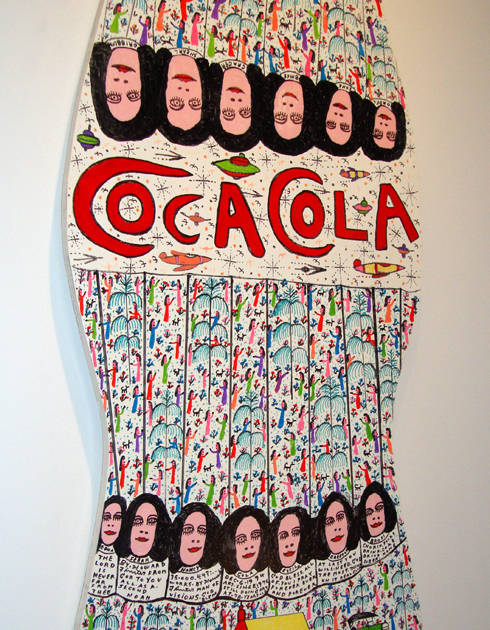 It also delves into the "why" Coke is such a popular beverage and share a little about Coke's worldwide community outreach. Welcoming visitors and locals alike is a bronze statue of John S. Pemberton—the creator of the original Coca-Cola formula. Relocated in 2007, the world of Coca-Cola is nestled between Georgia Aquarium and Imagine It! at the southern tip of Pemberton Place, a 20-acre park in downtown Atlanta created by The Coca-Cola Company. Arriving guests are invited to join together in the Main Lobby for a brief introduction to what promises to be an exciting adventure. While waiting, briefly, for entry into the museum, a photographer is on hand to create souvenir photos (one of many opportunities during a visit) and a docent begins telling the story of Coca-Cola, noting artifacts in the Lobby. In the Coca-Cola Loft, the next stop on the tour, visitors are given a brief introduction as to what to expect on the day's journey. A docent shares information about the Loft's collection of artifacts—some of Coke's oldest and most valuable. And the room is filled with more Coca-Cola signs than there are billboards in Atlanta, or so it seems. I was already liking that entry into the museum is timed, thus allowing for a more leisurely, pleasant exploration experience. The Happiness Factory Theater is a seated film presentation (the kids are going to love this one) that explores the "magic" that goes into every bottle of Coke. Highly entertaining and a little goofy, I enjoyed that the voices in this animated short included accents from around the world. 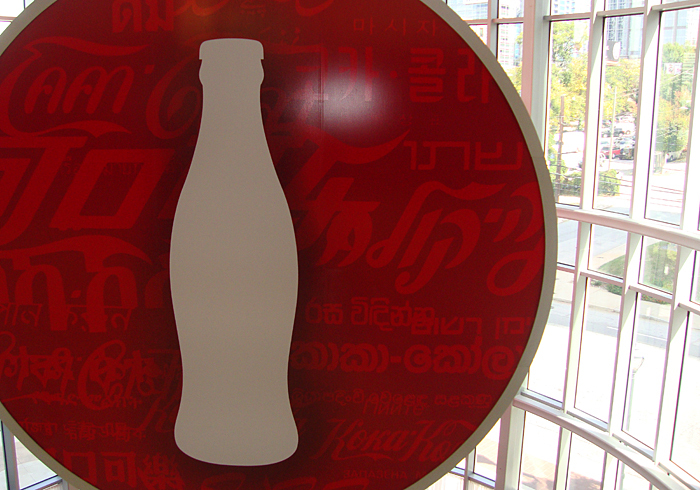 Following the brief film, we were granted access into the two-story heart of the World of Coca-Cola called "The Hub." From there we would be on our own to explore the remainder of the museum. One of the best recognized icons in Coca-Cola advertising is the Coca-Cola Polar Bear. Well, guess who was in The Hub for photo ops? That’s right! The Coca-Cola Polar Bear, and not the stuffed teddy bear size…I’m talking about a seven-foot tower of plush, white, furry fun. The kids loved him, especially the younger teens. At one point there was even a friendly cat-and-mouse chase between the Bear and a couple of the kids. On the north side of The Hub is the Coca-Cola Connections exhibit. 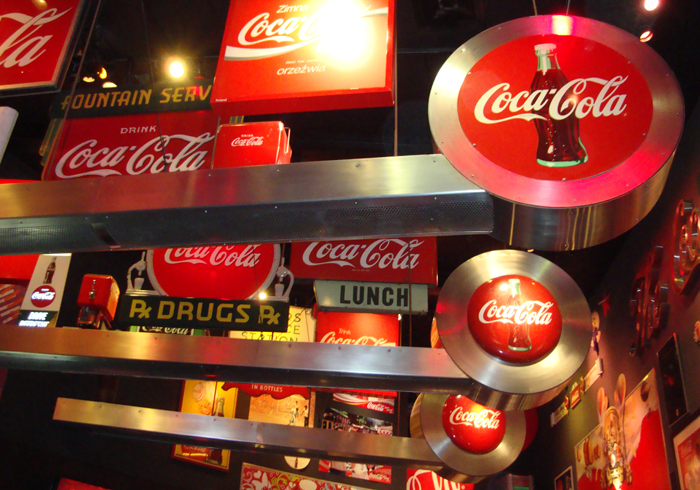 It consists of several interactive stations that let one explore the global connections that Coke creates. The "Bottle Works" exhibit is a real bottling center! The slowest (for demonstration purposes) bottling system in the world we were told. Seeing the automation of the bottling process has a pretty high cool-factor and there are ample plaques to explain what one is seeing along the viewing path. 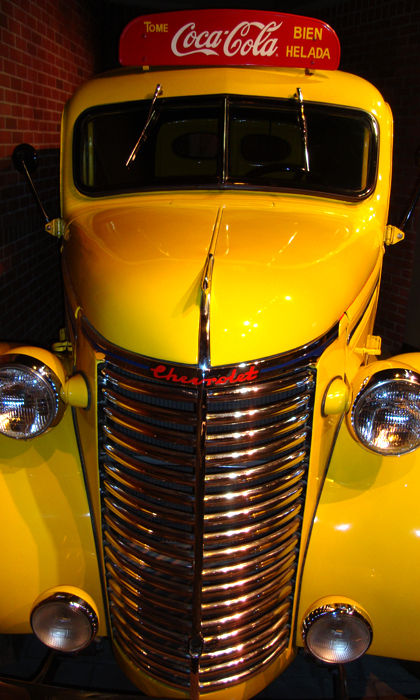 Milestones of Refreshment is an exhibit of pure history and a great opportunity to see the roots of Coke. Coca-Cola started with a single formula and today the company produces more than 450 brands in approximately 200 countries around the world. The Hub and the "balconies" of the second level are lined with giant Coke bottles that were decorated and presented to The Coca-Cola Company by countries around the world for the 1996 Olympic Games hosted in Atlanta. There's also a great view of Coca-Cola headquarters from the second level's northwest corner. Coca-Cola has supported the Olympic Games for more than 80 years. "In Search of the Secret Formula," a 4-D theater experience, was a bit more than I personally bargained for. I've been in 4-D theaters before, and I love a good rollercoaster ride, but this one is not for the faint of heart. The "ride" itself is turbulent (really! ), but the story being told is indeed entertaining. The Pop Culture Gallery was one of my favorites. 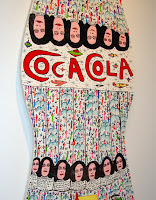 Modest in size, this gallery contains Coke art of a more modern take, including pop art and folk art, to name a couple. The Perfect Pauses Theater is, in contrast to the 4-D theater, a relaxing look at Coca-Cola advertising over the decades. Here I got to see Coke commercials that I remember seeing as a child, stirring my sense of nostalgia. There are also a lot of commercials that I never would have seen otherwise, commercials from other times and places around the world. I spent the greatest amount of time here than any other single exhibit. The capstone event of the tour (calling it a gallery would be too much of an understatement) is "Taste It!" In the Taste It! room, visitors have the opportunity to actually taste more than 60 different Coke products from five continents. And that's not all. There's also a new interactive tasting station, Coca-Cola Freestyle, where guests can make and taste any of 106 personally customized Coke creations. A very nice touch (I think) before entering the Coca-Cola Store, every visitor is given his or her very own commemorative bottle of Coke. The Coca-Cola Store itself, the museum's gift shop, is pretty amazing. Anything you can imagine that could possibly have a corporate logo on is probably here. It's its own world of discovery for the souvenir collector in all of us. The "why" of Coca-Cola's global community outreach is clear, in my mind that is. Although we come from many different nations and cultures, we are one people—the human race. Coke understands that. That a billion people enjoy Coke every day is undoubtedly great for business. The remarkable thing is that there are so few singular experiences that we all have in common, but enjoying Coke is one of them. The Coca-Cola Company, through its globally recognized brand, is quite generous in its efforts to provide education resources and community volunteers on a global scale, which visitors can learn more about at the World of Coca-Cola. Has my quench for Coca-Cola artifacts and knowledge been satisfied? I want more. I will probably wait until friends or family come to visit, but there is still a lot to see, so I'll definitely return. And I'm really looking forward to what I'm sure will be a year filled with Coca-Cola celebrations for its 125-th anniversary in 2011. Hours: Varies. Generally 9 a.m. – 6:30 p.m., but check their website.